Did you know you can buy Jane Austen doorknobs? My latest Austen Authors blog discusses decorating your house with Austen-themed decor. 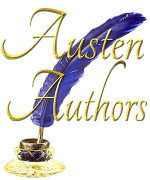 ← New Review of Darcy’s Honor at Austenesque Reviews!